This game should be a lot more than it is. You have the defending Super Bowl Champion playing last season’s Rookie of the Year -- one of the most exciting players in the league in years. It should be a thrilling game, and a great way to start the third week of the NFL season. Thanks to a frustrating loss by each team to start the season and some real issues for each squad, though, some of the shine has fallen off this game. The Giants looked rough in their opening loss to the Cowboys, and they didn’t exactly dominate the Bucs last week despite winning. Carolina lost to that same Tampa Bay team, and the Panthers came out on top against a flawed New Orleans squad last week. Both teams give us plenty of reasons to be uneasy. That means that the game still has the potential to be very good, but it could have been so much more. I’m not a big Eli Manning guy. He’s undeniably clutch, and he has the hardware to fall back on. However, there’s just a big part of his game I can’t get behind. His effort last time out against Tampa Bay is a perfect example of my issue. He threw for a career-high 510 yards — a stunning total — yet he wound up with a passer rating of just 89.5. That’s in large part because his three TDs were matched by three interceptions — and not pretty ones. For all that Eli can do, I will never put him in the top ranking of quarterbacks regardless of what he wins until he proves that he can keep his head in a game for a whole game. Manning had a far more pedestrian 213 passing yards in the opener, and Carolina has been respectable against the pass in their two games — the Panthers picked off Drew Brees twice and visibly frustrated him many more times — so New York’s passing attack is going to be a big storyline to follow in this one. For Carolina’s offense the key will be their ability to establish the run. Against New Orleans they ran the ball well. That contributed three touchdowns, and it also did a whole lot to open up the game for Cam Newton and the passing attack. 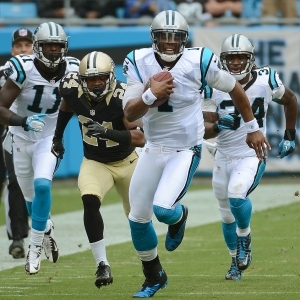 The Panthers are a much, much better team when they can run. Against the Bucs, though, they couldn’t get anything going. They ran for just 10 yards, and that meant that Newton felt like he had to gamble and force things. It didn’t go well. The Giants have been pretty average against the run so far. If they can assert themselves here then they’ll have a good chance of winning. Injuries are unfortunately going to be an issue for the Giants in this one. Wide receiver Domenik Hixon suffered a concussion last game and is likely to be out. So is offensive tackle David Diehl after he hurt his knee. Perhaps most significantly, starting running back Ahmad Bradshaw suffered a neck stinger and will likely be a game-time decision at best. Depth at running back is a concern for the Giants, so losing Bradshaw would be a major issue. The Panthers have proven to be vulnerable against the run, so missing Bradshaw could mean losing out on a potentially significant opportunity. It’s a relatively unique situation to see two opponents that have a common opponent after just two weeks of play. I’m not sure that we can learn a lot in terms of comparing these teams by looking at their efforts against Tampa Bay, though. Both teams were able to pile up the passing yards, but both teams made some big mistakes along the way as well. Neither team was great at establishing the run. Carolina was much better against Tampa Bay’s passing game than the Giants were, but New York was superior against the run. We can find points in favor of both teams, but neither one was clearly the better against Tampa Bay, so neither has an edge here based on that. The game opened with the home team a 1.5-point underdog, according to NFL odds. That has fallen slightly to a single point. The Giants have drawn more than 70 percent of the bets on this one, though, so there is a good chance that the line could rise by a point or so by game time. The total opened at 51 and has been reasonably stable at that level. The Giants have won and covered two of the last three meetings between these teams, but since they haven’t played since Cam Newton arrived in town that’s not really relevant. The over is 5-0-1 the last six times the Panthers have been home underdogs. I just don’t trust the Giants. they were lousy in their opener, and they needed a crazy comeback last week to avoid 0-2. They have some obvious talent — including the best corps of receivers in the league — but there are holes. I don’t love the coaching, and as I mentioned earlier I don’t trust Manning. Carolina is far from a complete team at this point, but they should be able to run, and they are at home, so they are well positioned to come out on top in this one. I would hesitate to give up too many points backing them, but as a home underdog they are certainly attractive. I’ll take the Panthers, and I lean towards the over.